This creamy dill sauce is fabulous on any fish. 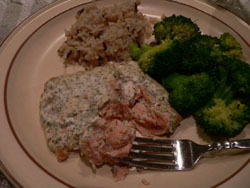 Made with sour cream, it really brings out the great flavor of baked salmon which you can find in my salmon-recipes page. I have also used this sauce on a grilled chicken sandwich in place of mayonnaise. The next night I was having asparagus, so I tried it on the asparagus and found it very good. When you have the sauce in the refrigerator, you will think of all sorts of different foods to use it on. Experiment, that's what makes cooking fun. Mix all in bowl and keep refrigerated until ready to use. Tip: For cooking light, use fat free or light sour cream.